The Bavarian Crafts Council (Bayerischer Kunstgewerbe-Verein) is a professional association for the promotion of contemporary crafts with around 400 members. BKV maintains in Munich a forum for ARTS + CRAFTS, which consists of the “Gallery for Applied Arts” (Galerie für Angewandte Kunst) and a spacious shop with a wide range of contemporary works of art. The BKV-Prize was therefore created in 2006 and is awarded once a year to promote the younger generation of artists. 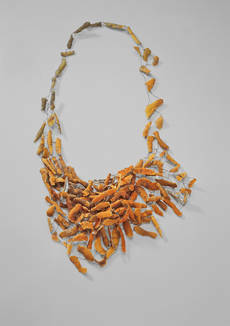 Susan Cummins, Chair of the Art Jewelry Forum (AJF), and Susan Kempin, Award Program Chair, are pleased to announce this year’s (2010) Emerging Artist Award winner, Agnes Larsson. Larsson was chosen from among 117 entries, from 38 countries. The goal of the Emerging Artist Award is to acknowledge promise, innovation and individuality in the work of emerging jewelers. The competition is open to makers of art jewelry who have recently completed their professional training and have not been a featured artist in a commercial gallery or museum. Larsson will receive a $5,000 cash award. In addition, her work will be featured by an AJF member gallery at the Sculptural Object and Functional Art (SOFA) Expo in Chicago and in AJF ads, and she will serve as a juror for next year’s competition. Jurors for the 2010 competition were Namita Wiggers, Curator at the Museum of Contemporary Craft, Portland, Oregon; Susan Beech, long-standing member of AJF and collector of contemporary jewelry; and Sharon Massey, jeweler and recipient of the AJF’s 2009 Emerging Artist Award. Criteria used in the judging were originality, depth of concept and quality of craftsmanship. Larsson used carbon and horse hair in this series of work she submitted. She allows the material to lead the way through the working process, drawing inspiration from thoughts about gravity, lightness and heaviness, death, life, transparency and darkness, growth, decomposition and transformation to show contrasts like fragility and strength, depth and surface, darkness and light. Karbon, kohlenstofffaserverstärkter Kunststoff, ist ein ungewöhnliches Material für Schmuck. Bei der Herstellung der Stücke spielte auch der Zufall eine Rolle. Die Farbe Schwarz, die reizvollen Oberflächen, die Bruchspuren: Erst bei der bewussten Beschränkung auf einfache, aber elegante Grundformen kommen sie zum Tragen. Ein wirkungsvoller Kontrast ergibt sich auch daraus, dass die schwer wirkenden Objekte in Wirklichkeit ziemlich leichtgewichtig sind.